Explore the various levels of sedation used in medical procedures and diagnostics and the various roles that nurses play within each sedation scenario. Examine the various position statements published by numerous national medical organizations, including the American Society of Anesthesiologists, Association of perioperative Registered Nurses, American Association of Nurse Anesthetists, and the American Association of Moderate Sedation Nurses, amongst others. Recognize some quality control measures such as institutional policies surrounding procedural sedation and how these policies should be developed. A Canadian study evaluating quality nursing care in the perioperative environment noted the significant difference in training that occurs now that nurses are being trained predominantly in undergraduate programs as compared to the diploma hospital-based programs seen more commonly before 1980. These older programs exposed nursing students to the operating rooms much more, and now the responsibility has shifted to post-graduate ongoing nurse training and professional certification in an effort to improve safety and as a means to accommodate for that lack of initial training. Specialty certification, they note, allows nurses to align themselves with standards of excellence as well as provides a mechanism for lifelong learning. They also concluded that effective communication, collaboration, and respect between members of the operative team lead to improved patient safety, which is after all, the entire point (Affleck, 2017). In order to assist patients through many of the diagnostic testing and medical procedures necessary in modern medicine with the highest level of comfort and safety possible, procedural sedation has become common in this country and worldwide. Previously termed conscious sedation, and now more appropriated named procedural sedation and analgesia (PSA) or moderate sedation and analgesia (MSA), it is defined by the American Society of Anesthesiologists (ASA) as administering medications to decrease the patient’s level of consciousness while still allowing them to respond purposefully to verbal commands, alone or accompanied by light tactile stimulation (ASA, 2017). In order to assist with further conversations, we will start by defining the various levels of anesthesia to differentiate PSA from others based on the ASA definitions. Procedural sedation can be broken down into three levels: minimal/light, moderate, and deep. Minimal/light procedural sedation is done to relieve a patient’s anxiety during a procedure without impairing their ability to respond to verbal stimuli normally and without affecting their airway maintenance abilities, spontaneous ventilation, or cardiovascular function. Moderate or procedural sedation is defined as a decreased level of consciousness but continued purposeful response to verbal and tactile stimuli, a maintained airway, adequate spontaneous ventilation, and cardiovascular function that is usually maintained. Deep sedation is then defined as a decreased level of consciousness in which the patient has purposeful responses after repeated or painful stimuli, intervention may be required to maintain the patient’s airway, spontaneous ventilation may be inadequate, but cardiovascular function is usually maintained (ASA, 2017). A fourth category, referred to as monitored anesthesia care (MAC), corresponds to the same three levels of sedation described above, but specifically involves the expertise and care of an anesthesia expert such as an anesthesiologist, a certified registered nurse anesthetist (CRNA), or an anesthesia nurse (ASA, 2013 and Bedford, Dean, and Walker, 2017). The presence of the anesthesia expert is what differentiates this type of sedation, not necessarily the level of sedation. This significant differentiation is important in cases during which there exists a risk of needing to convert to general anesthesia or deep sedation and the skills needed to rescue the patient’s airway if necessary (ASA, 2013). It is often the procedure at hand as well as the patient’s comorbidities and potential risk factors that lead to this distinction (ASA, 2013 and Bedford, Dean, and Walker, 2017). Risks of procedural sedation (at any level) include inadvertent or unintentional patient movement, agitation, confusion, aspiration, apnea, airway obstruction, desaturation/hypoxia, cardiovascular depression/collapse, brain damage, and death (Bedford, Dean, and Walker, 2017). Finally, under general anesthesia the patient is unarousable (by either verbal or tactile stimulation), intervention to maintain the patient’s airway is often required, spontaneous ventilation is often inadequate, and cardiovascular function may be impaired. General anesthesia cases always necessitate the involvement and supervision of an anesthesia professional (ASA, 2017). High risk: unstable ASA class 3 or ASA class 4 or above (Ogg, 2016). Additional considerations for an anesthesia consult include history of opioid abuse or the presence of a concerning airway (thick neck, inability to open mouth, limited extension) (Caparelli-White and Urman, 2014). Otherwise, the AORN position is that a registered nurse (RN) who is well-educated, experienced and familiar with the applicable policies and procedures is capable of administering and managing patients undergoing PSA. This includes familiarity/education regarding patient selection, patient assessment, monitoring equipment, pharmacology, compromised airway, basic dysrhythmia recognition and management, advanced cardiac life support (ACLS) and/or pediatric advanced life support (PALS), emergency response and management, complication recognition and management, and airway anatomy and physiology. Their guideline also recommends that providers consult their state board of nursing regarding regulations around specific medications such as propofol (Diprivan), ketamine (Ketalar), and nitrous oxide (Ogg, 2016). An interactive map, such as the one below from Sedation Certification’s website, may also be a helpful resource for perioperative nurses involved in procedural sedation care. 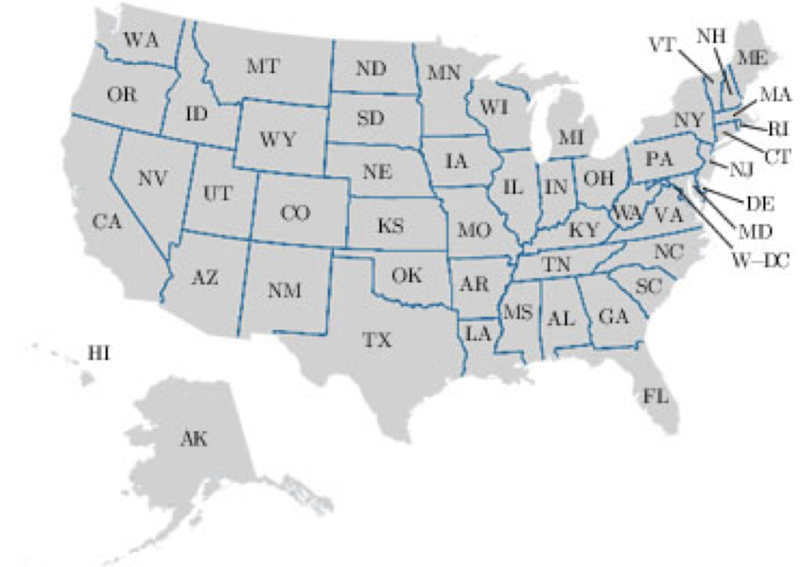 Click on the image below to visit sedationcertification.com to use their comprehensive and interactive breakdown of each state's sedation policies. The American Association of Moderate Sedation Nurses (AAMSN) published a guideline in 2017 regarding the role of RNs in the administration and management of PSA and specified the need for an appropriately trained and competent nurse to monitor the patient continuously during the procedure under the supervision of a licensed provider/practitioner. This RN would need to be familiar not only with state regulations but Joint Commission (JCAHO), institutional guidelines, and professional organizations as well (AAMSN, 2017). The American Association of Nurse Anesthetists (AANA) policy consideration published in 2016 is in agreement with all of the above practice guidelines (AANA, 2016). Regarding the use of PSA in the gastrointestinal endoscopy setting, which is a common use of this technique, the Society of Gastroenterology Nurses and Associates (SGNA) published their own guidelines in 2017. They recommend that the education and preparation for any provider administering PSA other than anesthesia professionals includes ACLS/PALS and the ability to recognize and rescue patients inadvertently placed into a deep sedation state. They state that RNs who are trained and experienced in gastrointestinal nursing can safely administer PSA under the supervision of a physician if able to assess, diagnose, intervene and rescue patients if necessary, and should be given the responsibility of administering reversal agents prescribed by the physician. They should understand incremental dosing, the synergistic effects of drugs, and the onset/peak time of the medications being used (SGNA, 2017). The emergency department is another common area where PSA is performed by individuals other than anesthesia professionals. The American College of Emergency Physicians (ACEP) position statement published in 2017 regarding PSA specified its importance in improving the quality of patient care by reducing procedure time, increasing the likelihood of success, and decreasing the risk of injury to everyone involved related to uncontrolled movements. They specify that emergency department nurses who demonstrate competency are qualified and capable of safely administering procedural sedation using propofol (Diprivan), ketamine (Ketalar), and other sedatives (ACEP, 2017). Regarding deep sedation, which is defined by the ASA as a patient who exhibits purposeful responses only after repeated or painful stimuli. Intervention may be required to maintain the patient’s airway, spontaneous ventilation may be inadequate, but cardiovascular function is usually maintained in deep sedation. This can be an intentional goal based on the patient’s risk factors or the procedure being performed, or an unintended consequence of over-medicating a patient who was originally supposed to be placed under PSA. In cases where deep sedation is an intentional goal, the ASA published an advisory statement in 2017 regarding the granting of privileges for administration of deep sedation to non-anesthesia physicians from various different specialties. Their final statement was that the participation of physician anesthesiologists in all deep sedation cases is the safest situation for the patient. If non-anesthesia physicians wish to perform these procedures, they first stipulate that the physician responsible for administering sedation and monitoring the patient is licensed in the state of practice and actively registered with the Drug Enforcement Agency (DEA), and must be different from the individual performing the procedure. They must be able to recognize a patient’s progression into general anesthesia, characterized by total loss of consciousness and lack of purposeful responses, and maintain vital functions until such a time that the patient can be rescued from general anesthesia. They suggest formal training through an Accreditation Council for Graduate Medical Education (ACGME) residency or fellowship or Accreditation Council for Continuing Medical Education (ACCME) program with competency standards, performance evaluations and a method for continuing performance improvement (ASA, 2017). A focus group study was completed with 24 different nurses experienced in the perioperative care of patients regarding the role of the RN and the pre-operative assessment in patient safety. The general consensus of this study was that the pre-operative assessment helps to catch potential red flags early and establishes a baseline. The preoperative assessment is especially important in the perioperative environment due to multiple care transitions and multidimensional communication amongst various providers (primary care provider, surgeon, multiple nurses, patient, etc.). They found that the nurse often acts as patient advocate, expectation manager, translator of information and the cog on a big multidisciplinary wheel (Malley, Kenner, Kim, & Blakeney, 2015). ASA 1: A normal healthy patient. Example: Fit, non-obese (BMI under 30), a nonsmoking patient with good exercise tolerance. ASA 2: A patient with a mild systemic disease. Example: Patient with no functional limitations and a well-controlled disease (e.g., treated hypertension, obesity with BMI under 35, frequent social drinker or is a cigarette smoker). ASA 3: A patient with a severe systemic disease that is not life-threatening. Example: Patient with some functional limitation as a result of disease (e.g., poorly treated hypertension or diabetes, morbid obesity, chronic renal failure, a bronchospastic disease with intermittent exacerbation, stable angina, implanted pacemaker). ASA 4: A patient with a severe systemic disease that is a constant threat to life. Example: Patient with functional limitation from severe, life-threatening disease (e.g., unstable angina, poorly controlled COPD, symptomatic CHF, recent myocardial infarction or stroke in the last 3 months. ASA 5: A moribund patient who is not expected to survive the next 24 hours without the operation. Examples: ruptured abdominal aortic aneurysm, massive trauma, and extensive intracranial hemorrhage with mass effect. All or part of this evaluation may be repeated on the day of the procedure. Informed consent with a thorough explanation of the procedure and the sedation’s risks, benefits, and alternatives should be performed and any necessary consults completed. The evaluation also gives the nurse an opportunity to provide the patient with education regarding pre-procedure fasting and what to expect on the day of the procedure (ASA, 2017). The pre-procedure fasting guidelines published by the ASA allow clear liquids up to 2 hours prior (this includes water, juice, tea, black coffee, and carbonated beverages), breast milk in infants up to 4 hours prior, formula in infants up to 6 hours prior, a light meal and/or milk products up to 6 hours prior, and proteins/fatty foods up to 8 hours prior to procedures. They also specify that in emergent or urgent situations, procedures should not be delayed based on fasting time alone. They approve of the use of gastrostimulants such as metoclopramide (Reglan), histamine 2 (H2) blockers, proton pump inhibitors (PPI), and non-particulate antacids in patients at increased risk of aspiration, but not for routine use to decrease aspiration risk in average patients. They approve of the use of pre-procedure antiemetics in patients at increased risk of post-procedure nausea and vomiting but do not recommend pre-procedure anticholinergics (ASA, 2017). In the emergency department, ACEP stated that pre-procedure fasting did not reduce the risk of aspiration or emesis in emergency department patients undergoing PSA (ACEP, 2017). The AORN guidelines echo all of the above and specify that the patient should be evaluated for potential mask ventilation difficulty (age > 49, BMI > 29, missing teeth, history of snoring or OSA, presence of facial hair, short neck, no visible uvula, advanced rheumatoid arthritis (RA), chromosomal abnormalities, tonsillar hypertrophy, or an especially small mouth). (Ogg, 2016). The SGNA guidelines further validate all of these recommendations (SGNA, 2017). Patient safety should be the nurse’s number one concern while navigating a patient through the operating room or monitoring patients undergoing PSA in other venues such as the endoscopy suite or the emergency department. When institutional policy at Massachusetts General Hospital no longer allowed nurses to monitor and administer deep sedation for advanced endoscopic procedures, a 2014 retrospective study looked at the incidence of anesthesia complications both before and after this change. They found significantly more anesthesia complications when sedation was administered by nurses (0.38%) versus when it was administered by anesthesia (0.08%). However, the study found no statistically significant difference in total complications, morbidity or mortality (Guimaraes, Campbell, & Richter, 2014). In a study done in 2017, 11 operative nurses were interviewed by researchers to attempt to determine how patient safety may be enhanced in the operating room from the perspective of nurses. The results indicated that nurses felt the most important thing they could do to help improve patient safety is by constantly managing risks and preventing harm. Specifically, they felt this could be accomplished by respecting the patient’s position of vulnerability, carefully navigating and guiding the patient through the perioperative experience, maintaining essential competencies expected of nurses in the operating room (organizational skills, technical skills, flexibility, calm, communication skills), and contributing to an overall culture of patient-centered safety in the operating room environment (Ingvarsdottir & Halldorsdottir, 2017). Checklists are commonly used tools that help provide consistency and structure to areas in medicine where such provisions have been shown to enhance safety and accountability. The operating room is one of those environments that has embraced the development of checklists to help improve patient safety. The large number of people needed to work cooperatively in the operating room in order for a single procedure to be completed successfully and safely has led to a lengthy checklist of items that are to be accomplished during each and every case to ensure that nothing is missed and that all things have been communicated amongst the team as effectively as possible. The World Health Organization (WHO) has published their surgical safety checklist, as well as the JCAHO and the AORN amongst others. The WHO checklist includes confirmation of patient identity, procedure to be performed, site (with markings), any medication allergies, and informed consent prior to the administration of any medications. Anesthesia must check that all their equipment and medications are present and functioning. The pulse oximeter must be present, operational, and turned on. It must be determined by the team if there is an increased risk of aspiration or a difficult airway, and if more than 500 ml of blood loss is expected during the procedure. Before the first incision is made, each team member is required to introduce themselves and their role in the procedure, as well as confirm the identity, procedure, and site again. Antibiotic prophylaxis should be confirmed as given if appropriate. The surgeon should share with the rest of the team any critical or difficult steps expected, the expected duration of the procedure, and the expected blood loss. The anesthesia professional should share with the team any patient-specific concerns that they have as well. Nursing confirms the sterility of any equipment needed and ensures all necessary equipment is functioning properly. Finally, any essential imaging should be displayed. Finally, at the completion of the case but before the patient exits the operating room, the checklist requires that the procedure performed is confirmed, counts are complete (instrument, sponge, and sharps counts), and specimens are properly labeled. Any equipment issues that arose during the case should be identified and addressed for future cases, and any patient care concerns for recovery are identified and communicated (WHO, 2018). Prior to the administration of anesthesia medications, the RN is responsible for confirming the presence of the history and physical exam, the preanesthesia assessment, the nursing assessment, any diagnostic or radiographic tests necessary, any blood products required, and any special equipment, devices, or implants needed. JCAHO also clarifies the formal “Time-Out” procedure of confirming the patient’s demographic details, the procedure, procedure site, and informed consent prior to the first incision. By combining these two checklists, the AORN has established a comprehensive surgical safety checklist that satisfies both organizations, as well as their own (AORN, 2016). Regarding staffing ratios, all of the guidelines reviewed had a very similar requirement regarding the monitoring of the patient. In cases where the registered nurse is responsible for administering procedural sedation and monitoring the patient, that nurse should have no other responsibilities. They clarify that they should be allowed to assist periodically with brief, interruptible tasks (such as tying gowns and opening packages) when the patient has reached a stable state, but otherwise should be included or involved in the procedure in any way. If needed, a second nurse should be scheduled to assist with the procedure directly and perform the circulator’s role to allow for continuous and direct monitoring of the patient during the procedure. The AORN guidelines even specify that the nurse responsible for monitoring the patient has “constant, unrestricted visual and physical access to the patient” (ASA, 2017; SGNA, 2017; AORN, 2016; AAMSN, 2017; AANA, 2017). During the procedure, they recommend monitoring the patient’s response to verbal stimuli every 5 minutes or so to document the patient’s depth of sedation. They recommend baseline and continuous monitoring of respirations via end tidal capnography, oxygenation via pulse oximetry with preset alarm limits, as well as observation of qualitative clinical signs and symptoms of proper ventilation and oxygenation. Baseline and continuous monitoring of heart rate and blood pressure throughout the procedure is also recommended. Continuous electrocardiogram monitoring is recommended during procedures where arrhythmias are common or in patients with known cardiovascular disease. They recommend the use of supplemental oxygen unless contraindicated. In the case of hypoxemia, hypoventilation or apnea during a case, the ASA recommends first stimulating the patient to breathe, administering supplemental oxygen, and providing positive pressure ventilation. If these three interventions are inadequate, reversal medications should be considered, and the patient should be observed closely to ensure that cardiovascular depression does not recur once reversal agents have worn off (ASA, 2017). The AORN guidelines include the suggestions above, and also stipulate that the depth of sedation should be documented using a validated scale such as the ASA, the Ramsay Sedation Scale, or the Modified Observer’s Assessment of Alertness/Sedation Scale. In cases where general anesthesia or deep sedation is desired, they also recommend using bispectral index (BIS) to measure the cerebral electrical activity with electroencephalography (EEG). The AORN and ASA guidelines differ in that the AORN suggests that supplemental oxygen be available but only given under the direction of the prescriber (Ogg, 2016). The SGNA guidelines point out that while monitoring devices are important and helpful, they should not be a substitute for watchful, educated assessment by the nurse. They specify that the nurse should be adequately trained in ACLS and/or PALS in case of an emergency. They agree with the continuous monitoring recommendations from the ASA mentioned above with the exception of capnography. They assessed inadequate evidence to support the routine use of end tidal capnography in patients undergoing PSA but should be considered in deep sedation cases or when using propofol (Diprivan) (SGNA, 2017). Various different medications and combination of medications are used for PSA. Most cases are done using intravenous (IV) medications such as opioids and benzodiazepines titrated to effect. AORN guidelines specify that a concrete plan be developed and discussed with the prescriber prior to the procedure including medications to be used and their routes of administration, predetermined depth of sedation, and expected length of the procedure, sedation, and recovery (Ogg, 2016). The ASA states that the most common combination of a sedative agent and an analgesic is acceptable, but that the two medications should be given separately in small incremental doses or via continuous drip infusion, titrated to effect for their individual purposes (sedative for anxiety relief, analgesic for pain relief). If medications are given IV, then vascular access is suggested throughout the procedure until the patient is no longer at risk of adverse effects. If oral medications are given, or IV access is lost during a case, the decision about whether or not to establish vascular access should be made on a case by case basis. Sufficient time should be allowed between doses to allow the drug to take effect, and bolus dosing should be avoided. Absorption time should be considered especially when oral, rectal, intramuscular or transmucosal administration routes are used. In regard to specific medications, the ASA found that dexmedetomidine (Precedex) may be used in lieu of benzodiazepines on an individual basis (ASA, 2017). The AORN also specifies in their guidelines that all medications to be given should be verbally confirmed with the prescriber and the patient’s maximum allowable dose should be calculated prior to administration, remembering to adjust for the weight and age of the patient (Ogg, 2016). The SGNA (2017) recommends that all IV medications be given from single dose vials. They also suggest topical pharyngeal anesthetic be applied for upper endoscopy procedures (SGNA, 2017). Propofol (Diprivan) is a hydrophobic, lipid-soluble hypnotic commonly used in general anesthesia and intensive care units (ICU) that has been studied and utilized for years in the procedural sedation environment. First FDA approved in 1989, the medical community was thrilled with its excellent safety profile. Its use is contraindicated in patients with very severe egg and soy allergies. It is important to note that propofol, along with ketamine, has no reversal agent. Additional downsides include an increased risk for infection that is not fully understood, necessitating strict aseptic technique during administration. It has a diminished safety profile in pediatric ICU patients. The hope for future research is to develop a water-soluble alternative (Adler, 2017). When evaluating cognitive function after PSA, Watkins, et al. found the administration of propofol alone (vs propofol with fentanyl or midazolam with fentanyl) resulted in less instances of required jaw lift maneuvers during the procedure, and a decreased effect on cognition at 24 and 48 hours as measured by the telephone interview of cognitive status (TICS). The combination of propofol with fentanyl lead to an increased incidence of deeper sedation ratings during the procedures by the administering providers while the group receiving midazolam/fentanyl reported more incidence of nausea (Watkins, et al., 2014). A joint position statement published in 2013 by the ASA and the American Association of Nurse Anesthetists (AANA) stated that propofol (Diprivan) should be administered only by persons trained in the administration of general anesthesia who are not simultaneously involved in the procedure at hand. They felt similarly about other IV induction agents such as etomidate (Amidate), sodium thiopental (Trapanal), and methohexital (Brevital). It is the responsibility of the nurse to be aware of any institutional or state policies regarding the administration of propofol or any other medications for PSA (AANA, 2013). In 2017 the ASA included in their PSA practice guideline the recommendation that if propofol (Diprivan), ketamine (Ketalar), or etomidate (Amidate) are to be used, the patient should receive care consistent with that required for general anesthesia, including the ability to identify and rescue patients from deep sedation or general anesthesia (ASA, 2017). ACEP publicly stated that emergency department nurses who demonstrate competency are qualified and capable of safely administering PSA using propofol (Diprivan) or ketamine (Ketalar) (ACEP, 2017). The constant monitoring and close evaluation of a patient following their procedure by nursing staff is endorsed by the position statements of the ASA, AORN, AANA, and the SGNA (ASA, 2017; Ogg, 2016; SGNA, 2017; AANA, 2017). The ASA guidelines specify that the recovery area should be stocked with all of the emergency equipment required to be present during the procedure (listed above) until the patient has reached near baseline mental status without further risk of cardiorespiratory depression. Pulse oximetry, ventilation, and circulation should be monitored regularly during this period, at least every 5-15 minutes, until discharge (ASA, 2017). The AORN points out that this recovery and discharge care should continue to be supervised by the prescribing practitioner (Ogg, 2016). In the case of infant and toddler patient, special care must be given to head position/control, so discharge should be made in the care of 2 responsible adults to allow for increased observation during the drive home (Ogg, 2016). The SGNA guidelines confirm that discharge criteria should be a written institutional policy. Both the AORN and SGNA specify that discharge instructions should not only be given by the nurse to the patient and caregiver verbally but also in a written format as well, including signs/symptoms of complications, when and how to contact the provider, which activities to avoid and for how long (those that require focused attention, physical effort, judgement, or decision making), diet, and medications (Ogg, 2016 and SGNA, 2017). Regarding the need for a responsible adult to accompany the patient home, the AANA published a position statement in 2018 specifying that a responsible adult be present to monitor the patient at discharge as well as provide transportation home. If not, they recommended that the procedure be rescheduled, the patient be admitted for observation, medical transport be arranged, or a longer recovery stay be arranged with additional clinicians providing opinions on discharge readiness at that time. The patient who is unaccompanied would require a taxi, rideshare or transport service (as they would not be permitted to drive themselves) with a responsible adult waiting at home to help care for and monitor them. Even in these circumstances, the AANA suggests notifying anesthesia prior to the procedure as they may want to adjust the amount/type of medications used during the procedure, and having the patient sign a discharge consent form outlining the risks (AANA, 2018). Alternate care arrangements if patient care is out of scope (Ogg, 2016). Caparelli-White and Urman discussed the development of a PSA policy within an institution. In addition to the above considerations, they also discussed the importance of outlining acceptable locations for PSA within the hospital (ED, ICU, OR, etc), clear roles/responsibilities (Operator vs Monitor), ongoing education and competency requirements, informed consent requirements, history and physical requirements and VS parameters (Caparelli-White and Urman, 2014). The ACEP guidelines similarly stated that institutional and department guidelines should be developed by a multidisciplinary team and address issues such as patient selection, patient preparation, informed consent, required equipment/monitoring, staff training/competency, criteria for discharge, continuing quality improvement, and nursing roles in sedation (ACEP, 2017). While it appears that RN’s roles in PSA are changing over time and constantly evolving, this should not surprise anyone, least of all the nurse. This fact is true throughout medicine, which itself is a constantly changing and growing field. Being aware of the local, regional, national, and personal boundaries that define the practice of nursing is one of the RNs most important roles. Adler, A. (2017). Propofol: Review of Potential Risks During Administration. AANA Journal,85(2), 104-107. Retrieved from https://www.aana.com/aanajournalonline. American Society of Anesthesiologists (ASA). (2014). American Society of Anesthesiologists Classification (ASA Class) System. Retrieved November 24, 2018 from https://www.ncbi.nlm.nih.gov/books/NBK441940/. Bedford, T., Dean, S., & Walker, J. (2017). A Comparison of Monitored Anesthesia Care (MAC) and Procedural Sedation and Analgesia (PSA): What LNCs Need to Know. The Journal of Legal Nurse Consulting,28(2), 17-23. Watkins, T. J., Bonds, R. L., Hodges, K., Goettle, B. B., Dobson, D. A., & Maye, J. P. (2014). Evaluation of Postprocedure Cognitive Function Using 3 Distinct Standard Sedation Regimens for Endoscopic Procedures. AANA Journal,82(2), 133-139. Retrieved from https://www.aana.com/aanajournalonline.